Links can connect to virtually any kind of file, such as word processing documents, spreadsheets, PDFs, compressed files, and multimedia. Two typical uses for non-HTML links are software and PDF download pages. Non-web files must nevertheless be accessed via the Internet, so they possess unique URLs, just like HTML pages. Any file on a web server (regardless of its type) can be linked using a URL. Prompt the user to save the file. Display the file without downloading it (common for PDFs). Display an error message (if the browser can’t handle or doesn’t recognize the type of file involved). 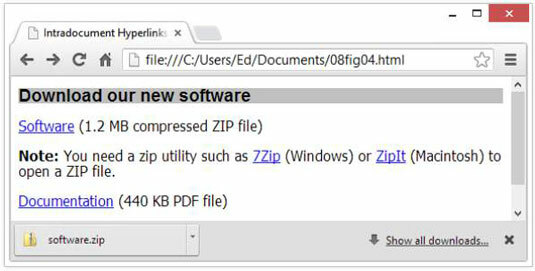 Compressed files: To work with the contents of a Zip file, the users need a compression utility, such as WinZip or ZipIt, if their operating systems don’t support Zip files natively. PDFs: To view a PDF file, users need the free Adobe Acrobat Reader (or some equivalent, such as Nitro PDF Reader). The figure shows how a browser renders this HTML, and the dialog box it displays when you click the Software link. A link to an e-mail address can automatically open a new e-mail addressed to exactly the right person. This is a great way to help users send you e-mail with comments and requests. An e-mail link uses the standard anchor element and an href attribute. The value of the href attribute is the target e-mail address, prefaced with mailto:. Open a new message window in the default e-mail program. Insert the address from the href attribute into the To field of the message. One safe way to provide an e-mail addresses is in the form: ed at edtittel dot com, knowing that people are smart enough to substitute @ for at and . for dot, and also knowing that address-harvesters usually aren’t that canny. If you elect to use a form instead, be aware that this too can present security issues — always be sure to check your input, or take steps to avoid so-called SQL injection attacks. For more info, see Colin Mackay’s article “SQL Injection Attacks and Some Tips on How to Prevent Them” on the Code Project website.